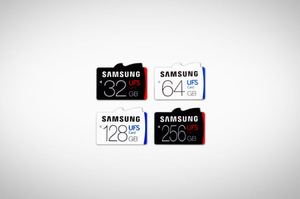 Samsung has unveiled the first UFS (Universal Flash Storage) memory cards this week, the evolution of microSD. The company is offering 32, 64, 128, or 256 GB capacity models and the performance is incredible compared to even the high-end current microSD cards. UFS cards offer sequential read speeds of up to 530 MB/s, multiples faster than microSD. Samsung says you can transfer a 5GB, 1080p movie in about 10 seconds compared to 50 seconds for the average UHS-1 microSD card. Write speeds are up to 170 MB/s, as well, about seven times faster than the average card aimed at consumers. For now, it is unclear what devices will support removable UFS cards and what the price will be for such a powerful chip. Are these cards backward compatible with the Micro-SD form factor??? No. Different shape, size, pinouts, and bandwidth. Actually, a week after this originally became news, I read an article that states that Samsung is trying to make it possible to use both the new cards and the old standard micro sd card fit in the same slot somehow for backwards compatibility. If they succeed at doing this then my hat is off to them for pushing the tech forward while not leaving the old tech behind! I saw the article on android authority I believe. It's highly unlikely you'll see any capability to use the new cards in older MicroSD slots, and there's no point in doing so anyway; these cards are guaranteed to be far more expensive, for a good long while, than their older cousins. Sorry I worded what I meant to say wrong. I mean going forward new phones with the new tech will be able to accept old microsd cards as well as the new cards. Obviously older devices will never be able to accept the new cards. I just meant to applaud Samsung for not totally abandoning microsd cards while we transition to the new tech. Hope I made sense this time!